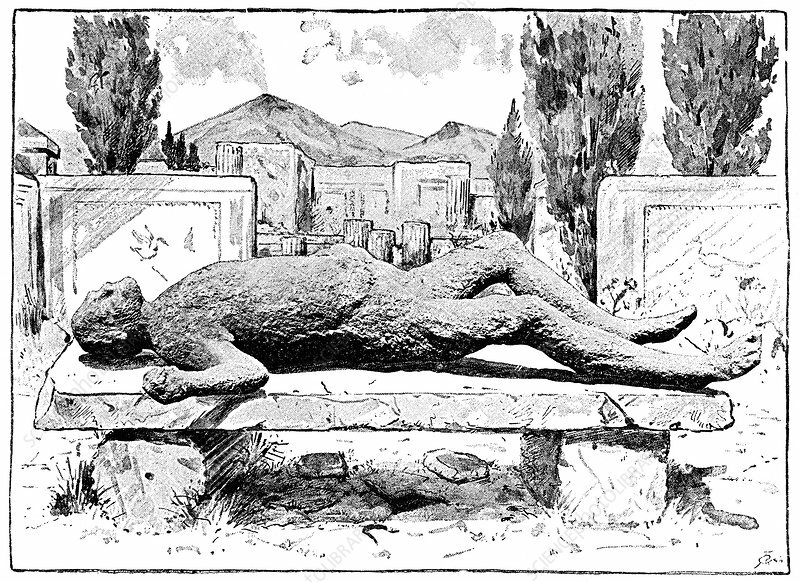 Plaster cast of Pompeii victim laid out on a bench in an excavated area, historical artwork. The Roman city of Pompeii, located in the Bay of Naples, Italy, was ruined and buried under thick layers of ash during an eruption of the volcano Vesuvius (shown smoking in the background) in 79 AD. The city was rediscovered and excavated in the 18th and 19th centuries. The remains and impressions of over 1000 human victims have been found. Plaster casts of the voids left in the ash by the bodies show their poses. Artwork from the third edition of 'Les Entrailles de la Terre' (1902) by French author Eugene Caustier.